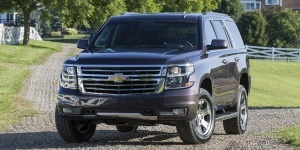 Powered by strong V8 engines, the Chevrolet Tahoe seats up to nine and tows up to 8,600 pounds. Four-wheel-drive is an option. For 2018, the Chevrolet Tahoe Premier is available with an RST 6.2L Performance Package that includes a 6.2-liter V8 engine mated to a 10-speed automatic transmission. LED daytime driving lamps are now standard on all models, while an RST Edition is now available on LT and Premier models. Get the best price for the Chevrolet Tahoe of your choice from a dealer in your area. Request a price quote now.